Championship side Leicester edged a thriller with League Two's Macclesfield to reach round two of the Carling Cup. Nat Brown's header gave the Silkmen the lead, but Robbie Neilson levelled on the rebound after Steve Howard's shot. Matty Fryatt curled in a second before scoring one-on-one to make it 3-1, only for Vinny Mukendi to head in a reply. Richie Wellens restored Leicester's two-goal lead from range, however, and even though Colin Daniel tapped in a consolation, the hosts held on. Leicester City manager Paulo Sousa told BBC Radio Leicester: "We created a lot of chances and scored a lot of goals but in these types of games we have to be very focussed to not concede. "The good thing is we won our first game at home and I'd like to think of that. "We are working on a defensive organisation and I saw some good things today." 93:52 The ref blows the whistle to start the match. 90:00+2:43 Attacking throw-in by Lewis Chalmers (Macclesfield). 90:00+2:11 Foul by Steve Howard on Nathaniel Brown, free kick awarded. Free kick taken by Lewis Chalmers. 90:00+1:28 Defending throw-in by Carl Tremarco (Macclesfield). 90:00+0:19 Steve Howard has an effort at goal from close range which goes wide right of the goal. 89:06 Short corner taken by Tom Kennedy from the right by-line. 88:39 The ball is crossed by Dany N'Guessan, Matt Fryatt takes a shot. Blocked by Hamza Bencherif. 87:50 Inswinging corner taken from the right by-line by Tom Kennedy. 87:43 Matt Fryatt sends in a cross, Nathaniel Brown gets a block in. 87:16 Goal kick taken short by Jose Veiga (Macclesfield). 87:12 The ball is sent over by Dany N'Guessan. 86:41 Attacking throw-in by Robbie Neilson (Leicester). 86:29 The ball is crossed by Richie Wellens, brilliant save by Jose Veiga. 85:43 Inswinging corner taken left-footed by Tom Kennedy from the right by-line, save by Jose Veiga. 85:28 Attacking throw-in by Robbie Neilson (Leicester). 85:13 Attacking throw-in by Dany N'Guessan (Leicester). 84:35 Shaun Brisley crosses the ball, save made by Conrad Logan. 84:10 Attacking throw-in by Lewis Chalmers (Macclesfield). 82:48 GOAL - Colin Daniel:Leicester 4 - 3 Macclesfield Goal scored by Colin Daniel from inside the penalty area low into the middle of the goal. Leicester 4-3 Macclesfield. 82:17 Richard Butcher takes a shot. Conrad Logan makes a brilliant save. 81:50 Defending throw-in by Robbie Neilson (Leicester). 81:24 Dany N'Guessan crosses the ball, save by Jose Veiga. 81:11 Goal kick taken long by Conrad Logan (Leicester). Correction - 81:11 Goal kick taken short by Conrad Logan (Leicester). 80:24 Corner taken by Lewis Chalmers, Nathaniel Brown has a headed effort at goal from deep inside the area missing to the right of the target. 80:15 Colin Daniel produces a cross, blocked by Michael Morrison. 79:23 Outswinging corner taken by Lewis Chalmers from the right by-line played to the near post, clearance by Steve Howard. 78:43 Unfair challenge on Tyrone Barnett by Dany N'Guessan results in a free kick. Free kick crossed right-footed by Richard Butcher, Michael Morrison makes a clearance. 78:06 The assistant referee signals for offside against Aman Verma. Free kick taken by Hamza Bencherif. 77:59 Defending throw-in by Carl Tremarco (Macclesfield). 77:27 Substitution Aman Verma joins the action as a substitute, replacing Joao Moreno. 76:41 Joao Moreno takes a shot. Steve Howard gets a block in. 76:11 Matt Fryatt takes a shot. Fantastic save by Jose Veiga. 75:57 Robbie Neilson crosses the ball, Hamza Bencherif manages to make a clearance. 75:37 The ball is delivered by Vinny Mukendi, clearance made by Michael Morrison. 74:55 Defending throw-in by Nathaniel Brown (Macclesfield). 73:11 Free kick awarded for an unfair challenge on Jose Veiga by Matt Fryatt. Direct free kick taken by Jose Veiga. 73:00 Tom Kennedy crosses the ball, fantastic save by Jose Veiga. 72:10 Defending throw-in by Robbie Neilson (Leicester). 71:53 Matt Fryatt is caught offside. Free kick taken by Jose Veiga. 71:23 Foul by Vinny Mukendi (Macclesfield) on Robbie Neilson (Leicester). Direct free kick taken right-footed by Robbie Neilson (Leicester) from own half, resulting in open play. Correction - 71:23 Vinny Mukendi gives away a free kick for an unfair challenge on Robbie Neilson. Robbie Neilson restarts play with the free kick. 70:49 Substitution Sam Wedgbury comes on in place of Matthew Hamshaw. 69:34 The assist for the goal came from Steve Howard. 69:34 GOAL - Richie Wellens:Leicester 4 - 2 Macclesfield Richie Wellens finds the back of the net with a goal from the edge of the penalty area to the top left corner of the goal. Leicester 4-2 Macclesfield. 69:15 Attacking throw-in by Robbie Neilson (Leicester). 69:00 Goal kick taken short by Conrad Logan (Leicester). 68:53 Matthew Hamshaw crosses the ball. 68:26 The ball is sent over by Dany N'Guessan, clearance made by Nathaniel Brown. 67:55 A cross is delivered by Matthew Hamshaw, Tom Kennedy gets a block in. The ball is crossed by Matthew Hamshaw, Jack Hobbs makes a clearance. 66:51 Corner taken left-footed by Tom Kennedy from the right by-line, Jose Veiga makes a brilliant save. 66:24 Dany N'Guessan takes a shot. Save by Jose Veiga. 66:18 The ball is swung over by Dudley Campbell. 65:52 The ball is swung over by Robbie Neilson. 65:17 Centre by Steve Howard, blocked by Vinny Mukendi. 64:47 Substitution Michael Morrison is brought on as a substitute for Matt Oakley. 64:47 Substitution Paul Gallagher leaves the field to be replaced by Dudley Campbell. 63:34 Assist on the goal came from Shaun Brisley. 63:34 GOAL - Vinny Mukendi:Leicester 3 - 2 Macclesfield Vinny Mukendi finds the net with a headed goal from close range. Leicester 3-2 Macclesfield. 63:19 Attacking throw-in by Carl Tremarco (Macclesfield). 62:26 Attacking throw-in by Robbie Neilson (Leicester). 62:21 Attacking throw-in by Robbie Neilson (Leicester). 61:56 Richard Butcher gives away a free kick for an unfair challenge on Richie Wellens. Direct free kick taken by Tom Kennedy. 61:05 Goal kick taken long by Jose Veiga (Macclesfield). 60:43 Effort on goal by Dany N'Guessan from just inside the area clears the bar. 60:18 Steve Howard takes a shot. Hamza Bencherif gets a block in. 59:50 Attacking throw-in by Carl Tremarco (Macclesfield). 59:21 Joao Moreno fouled by Tyrone Barnett, the ref awards a free kick. Tom Kennedy takes the free kick. 59:10 Goal kick taken long by Conrad Logan (Leicester). 58:27 Matthew Hamshaw takes the outswinging corner, Header by Shaun Brisley from deep inside the penalty area misses to the left of the goal. 57:52 Vinny Mukendi takes a shot. Brilliant save by Conrad Logan. 57:12 Defending throw-in by Carl Tremarco (Macclesfield). 56:08 Tom Kennedy is caught offside. Jose Veiga takes the free kick. 55:48 Attacking throw-in by Tom Kennedy (Leicester). 55:09 Free kick awarded for an unfair challenge on Hamza Bencherif by Steve Howard. Indirect free kick taken by Hamza Bencherif. 55:04 Goal kick taken long by Conrad Logan (Leicester). 54:17 Matthew Hamshaw takes a inswinging corner from the left by-line played to the near post, Hamza Bencherif has a headed effort at goal from deep inside the area missing to the right of the goal. 52:55 Goal kick taken long by Jose Veiga (Macclesfield). 52:55 Substitution Paul Bolland goes off and Lewis Chalmers comes on. 52:55 Substitution Emile Sinclair leaves the field to be replaced by Vinny Mukendi. 52:55 Matt Fryatt has an effort at goal from the edge of the area that misses to the right of the target. 52:14 Steve Howard takes a shot. Save by Jose Veiga. 52:04 Attacking throw-in by Paul Gallagher (Leicester). 52:01 Dany N'Guessan sends in a cross. 50:45 Assist by Richie Wellens. 50:45 GOAL - Matt Fryatt:Leicester 3 - 1 Macclesfield Goal scored by Matt Fryatt from inside the penalty box low into the middle of the goal. Leicester 3-1 Macclesfield. 50:05 Defending throw-in by Robbie Neilson (Leicester). 49:47 Defending throw-in by Carl Tremarco (Macclesfield). 48:49 Defending throw-in by Tom Kennedy (Leicester). 48:27 The ball is crossed by Dany N'Guessan, blocked by Nathaniel Brown. 47:53 Attacking throw-in by Robbie Neilson (Leicester). 46:42 GOAL - Matt Fryatt:Leicester 2 - 1 Macclesfield Matt Fryatt finds the back of the net with a goal from inside the penalty box to the bottom right corner of the goal. Leicester 2-1 Macclesfield. 46:07 Corner taken by Tom Kennedy from the right by-line, Jose Veiga makes a save. 45:58 Dany N'Guessan produces a cross, clearance made by Richard Butcher. 45:50 Attacking throw-in by Robbie Neilson (Leicester). 45:35 A cross is delivered by Robbie Neilson, clearance made by Nathaniel Brown. 45:00+0:43 The assistant referee flags for offside against Paul Gallagher. Hamza Bencherif takes the indirect free kick. 45:00+0:34 Goal kick taken short by Conrad Logan (Leicester). 45:00+0:12 Effort from the edge of the box by Shaun Brisley goes wide of the right-hand upright. 44:20 Tom Kennedy challenges Emile Sinclair unfairly and gives away a free kick. Matthew Hamshaw crosses the ball in from the free kick, blocked by Paul Gallagher. 43:56 Tyrone Barnett is flagged offside by the assistant referee. Indirect free kick taken by Tom Kennedy. 43:37 Cross by Robbie Neilson (Leicester), save (caught) by Jose Veiga (Macclesfield). Correction - 43:37 Robbie Neilson crosses the ball, comfortable save by Jose Veiga. 43:22 Defending throw-in by Paul Gallagher (Leicester). 43:02 Defending throw-in by Tom Kennedy (Leicester). 42:34 Steve Howard takes a shot. Jose Veiga makes a comfortable save. 41:17 Goal kick taken long by Jose Veiga (Macclesfield). 40:54 Dany N'Guessan has an effort at goal from deep inside the area missing to the left of the goal. 40:35 Attacking throw-in by Shaun Brisley (Macclesfield). 40:02 Matt Fryatt takes a shot. Save by Jose Veiga. 38:32 Defending throw-in by Tom Kennedy (Leicester). 37:47 Attacking throw-in by Robbie Neilson (Leicester). 36:38 Attacking throw-in by Carl Tremarco (Macclesfield). 36:27 Cross by Paul Gallagher (Leicester), save (caught) by Jose Veiga (Macclesfield). Correction - 36:27 Centre by Paul Gallagher, save by Jose Veiga. 36:19 The ball is crossed by Matt Fryatt. 35:48 Steve Howard takes a shot. Blocked by Hamza Bencherif. 35:23 Dany N'Guessan produces a cross. 34:29 GOAL - Robbie Neilson:Leicester 1 - 1 Macclesfield Robbie Neilson scores a goal from close range low into the middle of the goal. Leicester 1-1 Macclesfield. 33:57 Steve Howard takes a shot. Brilliant save by Jose Veiga. 32:43 Matt Fryatt challenges Nathaniel Brown unfairly and gives away a free kick. Direct free kick taken by Hamza Bencherif. 32:25 Goal kick taken long by Jose Veiga (Macclesfield). 32:02 Matt Fryatt produces a left-footed shot from the edge of the area and misses to the left of the goal. 31:35 Attacking throw-in by Robbie Neilson (Leicester). 31:10 Defending throw-in by Nathaniel Brown (Macclesfield). 30:49 Defending throw-in by Nathaniel Brown (Macclesfield). 30:09 Defending throw-in by Tom Kennedy (Leicester). 29:43 Attacking throw-in by Tom Kennedy (Leicester). 29:11 Goal kick taken long by Conrad Logan (Leicester). 29:02 Attacking throw-in by Shaun Brisley (Macclesfield). 28:33 Attacking throw-in by Shaun Brisley (Macclesfield). 27:37 Goal kick taken long by Jose Veiga (Macclesfield). 27:03 Inswinging corner taken by Tom Kennedy from the right by-line. 26:53 Cross by Richie Wellens (Leicester), clearance by Nathaniel Brown (Macclesfield). Correction - 26:53 Richie Wellens crosses the ball, Hamza Bencherif manages to make a clearance. 26:07 Corner taken by Paul Gallagher played to the near post, Dany N'Guessan produces a header from deep inside the area and strikes the post. 25:54 The ball is delivered by Joao Moreno, save by Jose Veiga. 25:29 Attacking throw-in by Tom Kennedy (Leicester). 24:59 Tom Kennedy takes the inswinging corner, Jose Veiga makes a fantastic save. 24:36 Unfair challenge on Paul Gallagher by Richard Butcher results in a free kick. Direct free kick taken by Paul Gallagher. 24:05 Outswinging corner taken from the right by-line by Matthew Hamshaw. 24:01 Goal kick taken long by Conrad Logan (Leicester). 23:07 Inswinging corner taken right-footed by Matthew Hamshaw played to the near post, Tyrone Barnett has a headed effort at goal from close in which goes wide left of the goal. 23:00 Paul Bolland produces a cross, Robbie Neilson manages to make a clearance. 22:40 Goal kick taken long by Jose Veiga (Macclesfield). 22:00 Corner taken by Paul Gallagher, save by Jose Veiga. 21:55 Dany N'Guessan produces a cross, Hamza Bencherif manages to make a clearance. 21:45 Attacking throw-in by Tom Kennedy (Leicester). 21:23 Defending throw-in by Robbie Neilson (Leicester). 20:57 Defending throw-in by Carl Tremarco (Macclesfield). 20:49 Matt Fryatt sends in a cross, clearance made by Colin Daniel. 20:26 Matt Fryatt sends in a cross, Nathaniel Brown makes a clearance. 19:34 Goal kick taken long by Jose Veiga (Macclesfield). 19:16 Shot from just outside the box by Richie Wellens misses to the right of the target. 19:01 Attacking throw-in by Tom Kennedy (Leicester). 17:28 Hamza Bencherif challenges Matt Fryatt unfairly and gives away a free kick. Paul Gallagher produces a strike on goal direct from the free kick, Jose Veiga makes a comfortable save. 17:23 Attacking throw-in by Tom Kennedy (Leicester). 16:43 Goal kick taken long by Conrad Logan (Leicester). 16:25 Colin Daniel produces a left-footed shot from long distance which goes wide right of the goal. 15:51 Corner taken by Tom Kennedy from the right by-line, clearance made by Nathaniel Brown. 14:46 Assist on the goal came from Matthew Hamshaw. 14:46 GOAL - Nathaniel Brown:Leicester 0 - 1 Macclesfield Nathaniel Brown finds the net with a headed goal from inside the box. 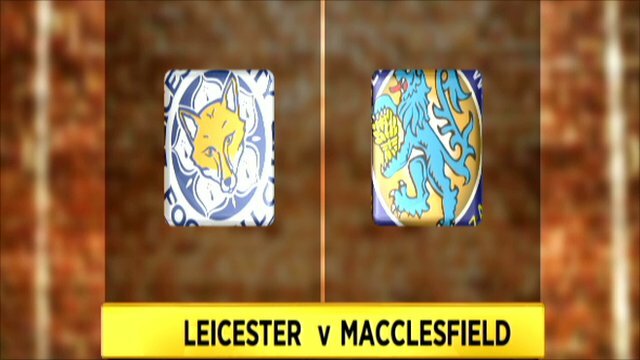 Leicester 0-1 Macclesfield. 13:46 The ball is delivered by Carl Tremarco, save by Conrad Logan. 13:09 Goal kick taken long by Jose Veiga (Macclesfield). 12:17 Free kick awarded for a foul by Nathaniel Brown on Steve Howard. The ball is swung over by Paul Gallagher, Header by Jack Hobbs from deep inside the penalty area misses to the right of the target. 11:58 Free kick awarded for an unfair challenge on Paul Gallagher by Shaun Brisley. Paul Gallagher takes the free kick. 11:37 Defending throw-in by Robbie Neilson (Leicester). 11:05 Defending throw-in by Tom Kennedy (Leicester). 10:35 Shot by Steve Howard (Leicester) right-footed from right channel (25 yards), save (caught) by Jose Veiga (Macclesfield). Correction - 10:35 Steve Howard takes a shot. Save made by Jose Veiga. 9:55 Shot by Matt Fryatt (Leicester) right-footed from centre of penalty area (12 yards), save (blocked) by Jose Veiga (Macclesfield). Correction - 9:55 Matt Fryatt takes a shot. Brilliant save by Jose Veiga. 9:21 Shot by Dany N'Guessan (Leicester) left-footed from left side of penalty area (18 yards), save (caught) by Jose Veiga (Macclesfield). Correction - 9:21 Dany N'Guessan takes a shot. Comfortable save by Jose Veiga. 7:55 Goal kick taken long by Jose Veiga (Macclesfield). 7:29 Attacking throw-in by Tom Kennedy (Leicester). 6:42 Emile Sinclair concedes a free kick for a foul on Joao Moreno. Robbie Neilson takes the direct free kick. 6:18 Attacking throw-in by Robbie Neilson (Leicester). 5:55 Defending throw-in by Jack Hobbs (Leicester). 5:29 Defending throw-in by Shaun Brisley (Macclesfield). Correction - 5:29 Defending throw-in by Nathaniel Brown (Macclesfield). 5:20 The ball is delivered by Robbie Neilson, clearance by Hamza Bencherif. 3:55 The assistant referee signals for offside against Richard Butcher. Conrad Logan takes the direct free kick. 2:56 Attacking throw-in by Robbie Neilson (Leicester). 2:27 Goal kick taken long by Jose Veiga (Macclesfield). 2:06 Matt Fryatt has shot on goal from just outside the area which goes wide of the right-hand upright. 1:31 Richard Butcher takes a shot. Conrad Logan makes a fantastic save. 1:25 A cross is delivered by Paul Bolland. Correction - 0:32 Goal kick taken short by Jose Veiga (Macclesfield). 0:32 Goal kick taken long by Jose Veiga (Macclesfield). 0:21 Attacking throw-in by Robbie Neilson (Leicester).